The French president François Hollande yesterday stated some home truths about the empty seats fiasco at the Olympics and made a cheeky dig at the British Prime Minister, David Cameron. 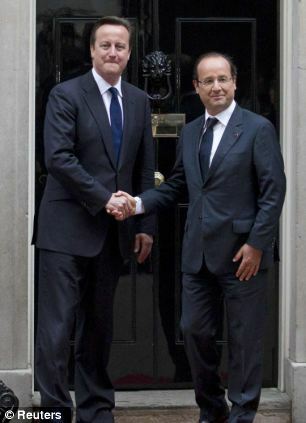 Cameron probably won’t be invited to the steps of the Elysée Palace soon unlike opposition leader Ed Miliband. Cameron and Hollande did however sit next to each other yesterday during the women’s handball game. Cameron made a statement before Hollande's stunning election victory in France, that Britain would roll out the red carpet for French citizens who wanted to avoid Hollande's 50% tax hike for high earners and snubbed him during his visit to the UK during his presidential campaign. The red carpet statement has come back to haunt him a few times since then and Cameron ended up rolling out the red carpet for Hollande during his first official visit to the UK as French President. “The British have rolled out a red carpet for French athletes to win medals. I thank them very much for that, but the competition is not over”. “The problem is that there are simply too many corporate seats. It will be up to French organisers to sort out this problem if a bid for a future games is to be successful”, hinting that an Olympic games in France would not pander to rich corporate sponsor interests and make more seats available to the general public. Hollande did not criticise the organisation of the London Games though. It could be that Hollande is hopeful that in France’s likely 2024 Olympic bid, Paris would be successful.